Button knots look like beads and make lovely accents for my ancient beads. I am so glad I mastered the button knot to tie this necklace of ancient glass beads from Vietnam. 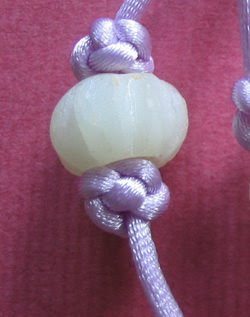 Cord knotting is also a gentler medium for stringing of centuries old beads. The large central greenish bead is barrel shaped while the two side beads are melons of a dark green shade. These beads may be imported from China or it maybe made locally. Looking at their general condition I make a wild guess that they may date from 1000 to 500 years old. This second necklace is also composed of glass beads from Vietnam. The knots used are the cross knot for the central bead and button knots for the rest of the necklace. 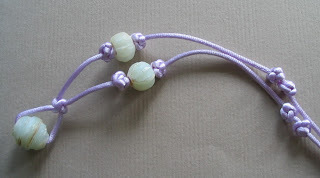 Lavendar is my favourite color and these lavendar cords and knots gently pamper the 1000 year ancient white glass beads from Vietnam. Seller said the beads belong to the Cham Dynasty(from approximately the 7th century through to 1832, according to Wikipedia) The central bead is ovalish or ovoid (I think this is not the correct bead description term, but nevermind) with impressed grooves. The accompanying 2 beads are melon shaped.